USGS science helps understand the causes, consequences, and benefits of wildfire and helps prevent and manage larger, catastrophic events. How do we balance protecting public health and the pollinators? The Ecosystems Mission Area provides impartial science information and tools to the Nation’s natural resource managers, with particular focus on the science needs of the Department of the Interior (DOI) and DOI bureaus to manage species, lands and priority ecosystems; fulfill treaty obligations; respond to and reduce threats to natural resources; and manage mineral and energy resources. Check out our Cool Tools for Hot Topics! USGS uses weather surveillance radar data and landscape-scale habitat metrics to model bird-habitat connections along the western coast of the Gulf of Mexico. Contacts: Wylie Barrow, Jr., Ph.D.
USGS scientists are working with collaborators to understand how Hurricane Sandy impacted wetlands in Jamaica Bay, New York. Wetlands in river deltas - like the Mississippi River Delta Plain - may be more vulnerable to sea-level rise. Historically, coastal wetlands responded to these changes by increasing surface elevation or migrating up-slope. USGS conducts research to identify the biogeochemical influences on sediment addition in coastal wetland areas. Contacts: Camille LaFosse Stagg, Ph.D., Ken Krauss, Ph.D.
To effectively manage an ecosystem, resource managers need a way to evaluate its health and ability to function. Metrics that indicate ecosystem condition - or indicators - can be used to help determine how well management strategies work. Sudden Marsh Dieback - SMD - has been documented for the past two decades throughout coastal areas of the United States. With these large-scale diebacks comes the loss of ecosystem functions and services. USGS scientsts use field work and greenhouse studies to investigate the factors that control the resilience and resistance of coastal salt marshes to SMD. Contacts: Camille LaFosse Stagg, Ph.D.
USGS research in the Florida Everglades will provide information on how environmental conditions and disturbances impact carbon storage in mangrove systems. When it comes to hurricanes, wind and storm surge effect vegetation differently. USGS anlyzes these differences following Hurricane Sandy to help inform management on storm mitigation and long-term planning. Population trends suggest that the Florida Grasshopper Sparrow may go extinct within five years. USGS research aims to collect demographic information to help identify the current status of the species. Coastal wetlands provide valuable ecosystem services such as wave attenuation, surge reduction, carbon sequestration, wastewater treatment, and critical habitats for endangered fish and wildlife species. However, wetland loss threatens the capacity of coastal wetlands to provide these ecosystem services. Letcher, B. H., J. D. Walker, M. J. O’Donnell, A. R. Whiteley, K. H. Nislow, and J. A. Coombs. 2018. Three Visualization Approaches for Communicating and Exploring Passive Integrated Transponder Tag Data. Fisheries 43(5):241–248. 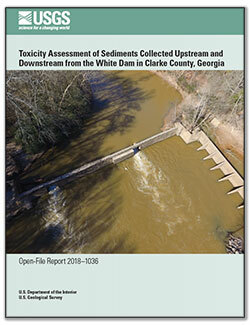 Lasier, P.J., 2018, Toxicity assessment of sediments collected upstream and downstream from the White Dam in Clarke County, Georgia: U.S. Geological Survey Open-File Report 2018–1036, 6 p., https://doi.org/10.3133/ofr20181036. Dibble, Kimberly L.; Yackulic, Charles B.; Kennedy, Theodore A.
Dibble, K.L., Yackulic, C.B., and Kennedy, T.A., 2018, Warm water temperatures and shifts in seasonality increase trout recruitment but only moderately decrease adult size in western North American tailwaters: Environmental Biology of Fishes, early view available online at: http://dx.doi.org/10.1007/s10641-018-0774-7. Harris, B.P., S.R. Webster, N. Wolf, J.L. Gregg, and P.K. Hershberger. 2018. Ichthyophonus in sport-caught groundfishes from southcentral Alaska. Diseases of Aquatic Organisms 128(2):169-173. 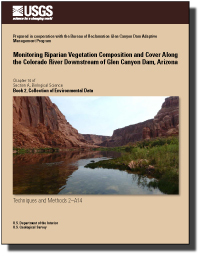 Palmquist, Emily C.; Ralston, Barbara E.; Sarr, Daniel A.; Johnson, Taylor C.
Palmquist, E.C., Ralston, B.E., Sarr, D.A., and Johnson, T.C., 2018, Monitoring riparian-vegetation composition and cover along the Colorado River downstream of Glen Canyon Dam, Arizona: U.S. Geological Survey Techniques and Methods, book 2, chap. A14, 65 p., https://doi.org/10.3133/tm2A14. 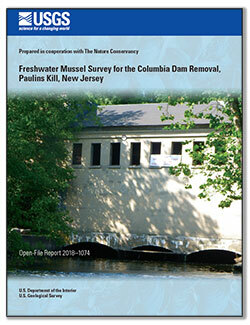 Galbraith, Heather S.; Blakeslee, Carrie J.; Cole, Jeffrey C.; Silldorff, Erik L.
Galbraith, H.S., Blakeslee, C.J., Cole, J.C., and Silldorff, E.L., 2018, Freshwater mussel survey for the Columbia Dam removal, Paulins Kill, New Jersey: U.S. Geological Survey Open-File Report 2018–1074, 7 p., https://doi.org/10.3133/ofr20181074. Lowe, Vanessa C.; Hershberger, Paul K.; Friedman, Carolyn S.
Lowe, V.C., P.K. Hershberger, and C.S. Friedman. 2018. Analytical and diagnostic performance of a qPCR assay for Ichthyophonus spp. compared to the tissue culture ‘gold standard’. Dis Aquat. Org. 128(3): 215-224. Borchert, S.M., Osland, M.J., Enwright, N.M., and Griffith, K.T., 2018, Coastal wetland adaptation to sea level rise: Quantifying potential for landward migration and coastal squeeze: Journal of Applied Ecology, Early View, https://doi.org/10.1111/1365-2664.13169. Thermal image of wolf with mange. A colorful clay-colored sparrow nest. These sparrows live in brushy grasslands and prairie habitats. F. Joseph Margraf, Jr., Ph.D.